7" Cool-Lightweight Lumbar Sacral Support Series 31-701XXX :: Orthopedics :: FLA Orthopedics Inc. This latex free lumbar sacral support helps provide support and compression to the lower lumbar region and abdominal area. This lumbar sacral support has a tapered front and a 7" high back panel, which is ideal for shorter or geriatric patients. Designed with a unique ventilated elastic construction making it cool and breathable. 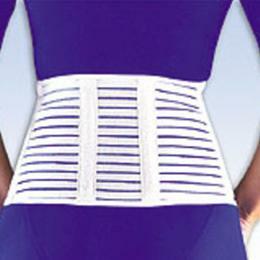 Four-inch wide tapered and breathable elastic bands overlap for a contouring shape to most body types. Four flexible plastic stays in the back provide light support. Latex free, with a soft plush finish that can be worn against the skin without risk of sensitivities. Measure around the fullest part of abdomen. 31-701 Small 28 - 32"
31-701 Medium 33 - 36"
31-701 Large 37 - 40"
31-701 X-Large 41 - 44"